Sure, it’s not the most pleasant topic to discuss, but your cat’s poop can give you an inside look at her health (pun intended!). Your cat is an important part of your life, and knowing what normal poop looks and smells like, and recognizing what isn’t normal, is a responsibility you, as a pet parent, must own. Bowel habits vary from cat to cat, but a health cat will typically have one bowel movement per day. A normal poop will be solidly formed and easy to scoop, with the size depending on your cat’s size and her diet. In general, cats with a diet that is grain-free will have smaller poop and they will be less stinky than those fed a high-filler diet. Why, you might ask? You see, nutrients in higher quality diets (i.e., those with little to no fillers) are better absorbed by the body, meaning less smelly waste as a result. Healthy poop is usually dark brown but that, too, can vary depending on your cat’s diet. When indigestible portions of food (such as fillers) pass through your cat’s intestines too quickly, diarrhea can be the result. Sadly, diarrhea is quite common in cats and can also be the result of parasites, a virus, exposure to toxins, kidney disease, intestinal cancers, and a variety of other diseases. With diarrhea, soft stool may be formed, or your cat’s poop may resemble more of a cow patty. It can also be complete liquid mixed with mucous. If your kitty has one or two soft poops, but isn’t showing any signs of distress such as no desire to eat or drink, then diarrhea typically is not an issue and should resolve itself within 24 – 48 hours. But, if your cat experiences multiple episodes of diarrhea per day, in conjunction with lethargy, refusal to eat, and/or vomiting, then dehydration is a great concern and your cat should visit your vet. When poop is retained in the colon, constipation occurs. The longer the poop remains in the colon, the harder it becomes, causing water to be removed from the colon. If your kitty is constipated, she will likely strain in the litter box and the poop she does produce will be very small, dry and hard. If you notice your cat is suffering from constipation, seek veterinary assistance. 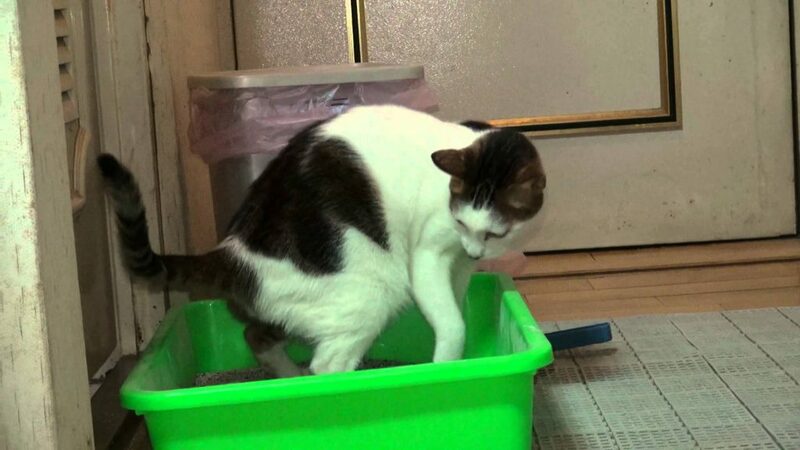 Both diarrhea and constipation may cause your cat to poop outside of her litter box, but some healthy cats do this, too. If you experience this with your cat, the first course of action you should take is to bring your cat for a vet visit in order to rule out any medical issues. If medical issues are ruled out, then the problem is likely a behavioral one, and you’ll need to pay close attention to your cat in an effort to determine the problem and work to correct the behavior. If your cat’s poop is pale white, grey, black or green, she may require immediate veterinary care. Pale white, grey or green poop may signal liver disease or an intestinal infection, and black poop usually points to internal bleeding. Yes, poop isn’t a pleasant topic, but it’s one that deserves special attention when it comes to the overall health and well-being of your favorite feline. We cherish our pets, but, just like with human, sometimes their habits can be utterly annoying! Here’s a few tips on how to handle those habits, while nicely reminding Fluffy and/or Fido who’s the boss. Why He Does It: Many dogs bark in an effort to notify the family pack that someone is approaching. In your dog’s mind, barking seems to banish an intruder, so he keeps doing it. For instance, the UPS delivery driver approaches your house, rings the doorbell, and your dog barks. The delivery driver leaves and your dog gives himself a pat on the back because he did his job and achieved success. What You Can Do to Stop It: Ask a friend or family member to come to the door and scratch it softly enough that the sound does not entice your dog to bark. Praise Fido and reward him a treat. Work up to tapping on the door, followed with praise and a treat; then knocking; and finally ringing the bell (with each step followed with – you guess it – praise and a treat). Before you yell “stop barking, Fido!” your dog will start sniffing for treats whenever there’s a noise at the door. Praise him before giving him the treat and, eventually, praise alone may be reward enough for Fido. Why She Does It: Cats scratch in order to mark their territory and because it helps them shed the outer layer of their claws. What You Can Do to Stop It: Find Fluffy the scratching post of her dreams! Some cats prefer carpeted posts while others are drawn to rope covered posts or even plain old cardboard. And some prefer something flat on the ground, while others like to stretch upward as they scratch. The key is to take notice of Fluffy’s scratching habits, noting her preferences, and buy her a scratching post that she won’t be able to refuse. Place the post or mat right next to her favorite scratching item (your couch, your antique chair, your favorite rug…) and teach her to refocus her scratching energies on the post. Once she has adapted to the post, feel free to relocate it to a less intrusive area of your home. Why He Does It: Your dog is a bundle of curiosity who wants to see and sniff everything he can, all at once. 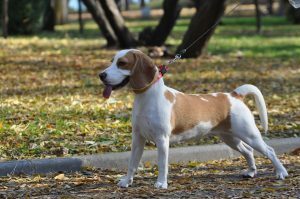 What You Can Do to Stop It: To manage a pooch who’s a leash puller, try a head halter or a front-clip harness. Even better, train Fido to walk properly. One simple trick to try is to simply stop moving forward when he pulls and reward him with treats when he walks by your side. 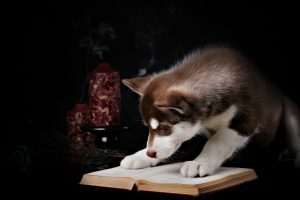 Granted, it’s not always that easy, so if you need other possible solutions, check out this video by world recognized dog trainer Victoria Stilwell. Why She Does It: If your older cat meows at night, you may want to have her checked by your vet, as nighttime vocalization is one sign of hyperthyroidism. An aging pet may lose certain cognitive abilities, leading her to become less restful at night. Other causes could be something provoking the her (another cat outside the window), a change in her environment or routine, or even boredom. And if your cat hasn’t been spayed or neutered, those night howls could be mating calls. What You Can Do to Stop It: If mating is the motive for your kitty’s howls, having Fluffy fixed should be your first course of action. If not, request your vet test Fluffy for hyperthyroidism. If she is diagnosed, treatment options include surgery, daily medication, or radioactive-iodine therapy. A change in diet may also help, as antioxidants and vitamins C and E may reverse brain-aging changes. If medical issues and outside disturbances are ruled out, you’re likely dealing with a cat who simply wants attention at 3 a.m. Perhaps assign some play toys as “nighttime-only” toys and give them to Fluffy before you hit the sack. It’s likely her nighttime meowing is a test of will, so stand firm and ignore her, and the situation will likely resolve itself. What is she eating now? If you’ve ever watched the TV Show “My Strange Addiction,” you’ve likely seen stories of people who have an unusual “habit” of eating non-food items, such as chalk, mulch, dirt, etc. This “habit” has a name – pica – and it is an obsessive-compulsive disorder that can be experienced by animals, as well as humans, especially cats. If you’ve ever noticed Fluffy devour cotton, paper, shoelaces, or any other item not meant to be consumed, be wary! It can be quite dangerous for your kitty to engage in pica, as ingesting non-food items can result in digestive upset, choking, and intestinal obstruction that could be serious enough to require surgery. Desensitizing your cat by redirecting her unwanted behavior into a more positive activity. Remove the inappropriate items that your cat eats from his reach. 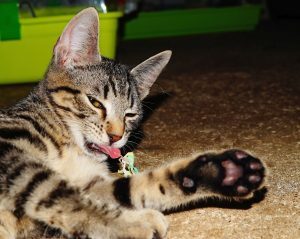 Do not react negatively or positively when you see your cat engaging in the pica behavior. Simply remove the item she is eating. Redirect your cat to a more positive behavior by giving her an appropriate toy to chew on, or involving her in an activity. Give her plenty of praise or treats when she does redirects her attention successfully. Provide ample playtime – make sure you play with Fluffy at least once per day. Provide toys made of rubber or plastic, rather than fabric or stuffed toys, which are easier to eat. Try walking Fluffy outdoors with a leash and harness. Not all cats are amenable, so take cues from Fluffy to determine whether or not she enjoys the activity. If she does, regular walks can be a good stress-reliever for you both! Offer catnip plants or cat grass to Fluffy as a safer alternative to non-food items. Keep Fluffy occupied with a small dog Kong filled with kibbled cat food or cat treats. It’s not uncommon for a cat suffering with pica to require medication. Your vet may determine anti-anxiety medication is necessary. Pica can be a frustrating situation for pet parents, but always remember it is not in your best interest or the best interest of your cat to deal with it using punishment. This will likely make the problem even worse by adding even more stress and anxiety for your cat. As we age, we learn to pick up cues from our friends, family members and acquaintances that give us an indication of how they’re feeling. For example, if your friend’s head is held low and her shoulders are hunched down, it is likely safe to assume she’s just not a happy camper; perhaps she’s sad or not feeling well. As humans we have the benefit of vocalizing our feelings, too, so determining how someone is feeling doesn’t have to rely solely on body cues. Unfortunately, we just don’t have that luxury with our canine companions; unlike humans, dogs rely solely on their body language to get their message across. Many pet parents simply aren’t proficient in understanding their pooch’s body signs, which can lead to confusion and misunderstanding, and may even weaken their bond. Front body lowered, ears up, mouth open, eyes wide, tail wagging up high. This is a classic invitation to play! It’s your dog’s way of saying “I’m friendly; let’s play!” You’ve likely noticed your pooch assume this position just before he runs toward you or in a random direction, displaying his eagerness to engage in some playtime. This happy mood may also be highlighted with random barking and playful jumps. Head held high, eyes focused, ears pointing upright. Head held high, ears pointed sharply upright, lip curl that reveals teeth. This is your dog’s way of saying “Back off!” This warning can be especially serious when combined with direct and intense eye contact, which means he is sensing a threat to himself or his family. Eyes wide, nose wrinkled, hair along the back raised, tail tucked between back legs. If your dog displays this posture, he is frightened and feels like he is greatly threatened or he is anxious. Don’t mistake this stance with one of submission, as he is ready to attack despite his fear. If you notice the corners of his mouth pull back slightly, he is ready to bark and bite for protection. 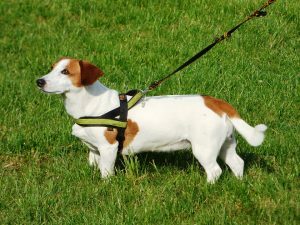 Lowered body that is slightly leaned back, lowered tail that may wag slightly, quick glances, ears pulled back. This is your pooch’s way of saying “I surrender” when approached by a dominant individual or animal. His stance shows he is trying to appease and avoid possible confrontation, and his body is leaned back to allow him to make a quick retreat, if necessary. Hey, there is some good stuff in here, check it out! !